It appears that Billy (Wahlberg) is a seasoned SWAT officer who has a reputation for getting physical while getting the job done. If you were wondering– yes, this appears to be another film where Mark is frequently beating people to a pulp while asking rhetorical questions. (“Do you know who I am?”) Surprise! We then discover that Mayor Nicholas (Crowe) is running for re-election in New York City, based on the premise that he’s changed things for the better. His speech begs the question: how bad was it before this guy took office? We then discover that there’s more to Crowe’s character than his political agenda: Nicholas recruits Billy, a ‘hero’ in his book, to become a private investigator to spy on (Read: “hunt”) his allegedly unfaithful wife (Catherine Zeta-Jones). Billy and his assistant are utterly shocked when they discover the identity of the man involved, and are reluctant to hand over the documents to Nicholas. Ultimately, we discover that Nicholas had a master plan after all. By using what we presume is footage of Billy murdering another individual in cold blood, Crowe attempts to manipulate Wahlberg into doing his dirty work for him. (“Did you ever think of why I chose you? Because I own you.”) Just like other movies of its type, it looks like ‘Broken City’ will demand your attention for its full duration, all while racking up a pretty high body count. Obviously it won’t be a genre-changer, but count me in! ‘Broken City’ is slated to premier January 18th, 2013, and I know where I’ll be that night. 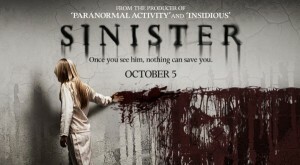 Sinister Movie Trailer – I just finished watching this trailer for the first time and I don’t know that my eyes could have gotten any larger! This movie looks…AMAZING! Guess what I’ll be seeing on October 5? Oh, it doesn’t seem fair to make you guess..I’ll tell you! SINISTER! From what I can gather (since this post is on the trailer only) is that family died (murder/suicide…one or the other or a combination of both) in a home that Ethan Hawk, an author, and his family move into. Apparently they’re forced to move from a more expensive home. Ethan claims that he’s going to write the best book ever written. He comes across a box of movie reals that show various family movies of the family that died in the house before…including the hangings…or at least part of them. Whether or not they’re really on the movie real or if Ethan is just “shown” that part isn’t clear. Apparently the children start to be haunted/visited by the children of the deceased the family and things start getting interesting! There is something out there that feeds on the souls of children that see this being in photos. Paranormal Activity 4 Official Trailer – I can’t wait to see this movie. I really REALLY loved the first 2 movies. The third one was good but I didn’t think it compared to the first 2. I’m hoping 4 brings back the excitement of 1 and 2 and doesn’t turn out to have accomplished jumping the shark. In the 4th installment to the movie the story hasn’t released. The first movie was about a family with a new baby boy being tormented by an evil entity in their home. The second movie released was a prequel to the first movie released and centered around the sister of the woman in the first movie…follow? We find out in this movie why the family in the first movie was being tormented. In the third movie we get a prequel to the prequel…yep! So the storyline order (for the 1st 3 movies) is 3, 2, 1. If you watch the movies in that order you will be watching in chronological story order. In the 3rd movie we see the sisters from the first two movies as little girls and find out where the story began. The only hint to the storyline for the 4th movie is what is printed on the movie poster: “All of the activity has led to this…” So it looks like the 4th movie will actually be the 4th in the storyline and falls in storyline place.